Sure, roast pork might be a tad traditional, but this recipe is so easy, even a novice cook could turn out a sublime main course. From 4 Ingredients Christmas: Recipes for a Simply Yummy Holiday. Preheat the oven to 425°F. Place the pork in a roasting pan, rind side up. Using a sharp knife, score the rind at 1⁄2-inch intervals, cutting deeply almost into the fat layer. Rub 2 tablespoons of the olive oil into the rind and drizzle with the lemon juice. Generously sprinkle 2 tablespoons sea salt flakes over the rind and press into the scores. Drizzle the remaining 1 tablespoon oil in the pan and roast for 20 minutes. Reduce the heat to 350°F and cook for another 2 hours (or about 30 minutes per pound). 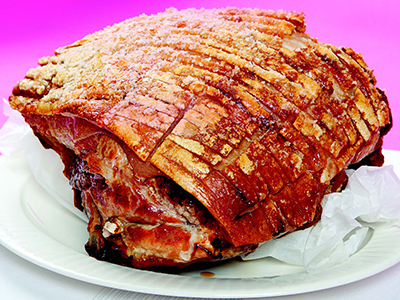 Optional: For great crackling, look for a good coverage of fat and rind. You might have to special-order from your butcher to get the rind. Easy, elegant holiday entertaining is as simple as 1-2-3 . . .4 INGREDIENTS! MOUTHWATERING Christmas Day brunch. Fun snacks for Santa and his reindeer. Hearty, flavorful main courses for a bountiful holiday table. Hours of work in the kitchen and too many dollars spent at the checkout line? Not with 4 Ingredients Christmas. 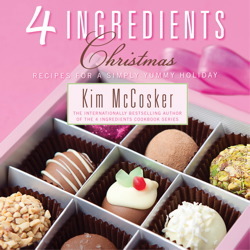 Kim McCosker, the internationally bestselling author who brought you 4 Ingredients and 4 Ingredients Gluten-Free, has once again created a delightful collection of quick, easy, and delicious recipes, all using four or fewer ingredients. Maple & Pepper–Glazed Turkey, Roast Pork & Crispy Crackling, Sweet Squash Galette, Cinnamon Stars, and a decadent Christmas Candy Martini will help create the illusion that you worked endlessly in your kitchen anticipating your guests’ arrival. You will be amazed by what you can create with just the right ingredients. Kim McCosker is the co-creator of the most successful cookbook series in Australia—4 Ingredients. She is the author of 4 Ingredients Kids, 4 Ingredients One Pot, One Bowl, and, with Rachael Bermingham, 4 Ingredients and 4 Ingredients Gluten-Free. She lives in Australia with her family. Find out more at 4Ingredients.com.au.